For other people with the same name, see Damaskinos (disambiguation). 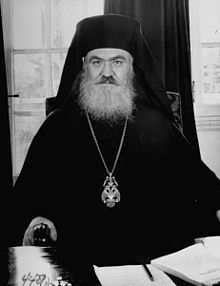 Archbishop Damaskinos Papandreou (3 March 1891 – 20 May 1949) was the archbishop of Athens and All Greece from 1941 until his death. He was also the regent of Greece between the pull-out of the German occupation force in 1944 and the return of King George II to Greece in 1946. His rule was between the liberation of Greece from the German occupation during World War II and the Greek Civil War. He was born Dimitrios Papandreou (no relation to the Papandreou political family from Achaea) in Dorvitsa, Greece. He enlisted in the Greek army during the Balkan Wars. He was ordained a priest of the Greek Orthodox Church in 1917. In 1922, he was made Bishop of Corinth. He spent the early 1930s as an ambassador of the Ecumenical Patriarch in the United States, where he labored to help organize the Greek Orthodox Archdiocese of America. In 1938 he was elected Archbishop of Athens, taking the name Damaskinos. Ioannis Metaxas, dictator of Greece at the time, objected to Damaskinos and forced the cancellation of his election, and the appointment of Metropolitan Chrysanthus to the post. After the 1941 German invasion of Greece and the fall of the Greek government, the Metropolitans who had elected Damaskinos seized the opportunity to eject Chrysanthus from the throne (with German agreement, as the latter had refused to be present at the oath-taking ceremony of the quisling Prime Minister Georgios Tsolakoglu), and Damaskinos was reinstalled. The Archbishop of Athens was the spiritual leader of the Greek Orthodox people of Athens and All Greece, and Damaskinos worked very hard to live up to his position during those hard times. He frequently clashed with the German authorities and the quisling government. In 1943, the Germans began the persecution of the Jews of Greece, and their deportations to Nazi concentration camps. Damaskinos formally protested the actions of the occupational authorities. According to the International Raoul Wallenberg Foundation, the appeal of Damaskinos and his fellow Greeks is unique as no document similar to the protest against the Nazis during World War II has come to light in any other European country. The Archbishop was being boldly sarcastic, as he was referring to the lynching and hanging of Patriarch Gregory V of Constantinople by a Turkish mob in 1821, the point being made that the SS commander would act in a similarly barbaric fashion if he were to carry out his threat. The churches under his jurisdiction were also ordered quietly by Damaskinos to distribute Christian baptismal certificates to Jews fleeing the Nazis, thus saving thousands of Romaniote Jews in and around Athens. 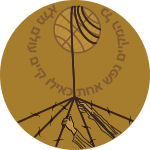 For his actions in saving Greek Jews during the Holocaust, he was named among the Righteous Among the Nations distinction by Yad Vashem. After the occupation ended, Damaskinos was proclaimed regent of Greece until a referendum to be held for the return or not of King George II from exile. During this time, fighting broke out between pro-royalist Greek soldiers and communist partisans (Dekemvriana events). He took control of the situation in his early term, appointing himself Prime Minister during late 1945. Though he wielded little power in his latter term, Damaskinos continued to call for peace and order in the country. He relinquished his position after fighting began to die down and recalled the king formally on September 28, 1946. He died in Athens in 1949. ^ Quoted from United States Holocaust Memorial Museum Archived 2005-04-21 at the Wayback Machine. Wikimedia Commons has media related to Archbishop Damaskinos of Athens. This page was last edited on 29 January 2019, at 00:09 (UTC).